You Save: $9.96 (67%) Ships in 1 day. Publisher: University Press of New England, 2006. Soft Cover, 276 pages, 6x9. A comprehensive guide to the brewpubs and breweries of New England. Whether well-brewed beer is the focus of a trip or a welcome compleement, beer enthusiasts and novices alike will find this guide a worthwhile companion wherever they travel in New England. Profiles of nearly 100 establishments in New England, offering descriptions and history of each, as well as insights into each brewmaster's philosophy and brewing style. Judicious evaluations of an establishment's food, ambience, and beer. Complete guide information, including availability of tours, directions, hours of operation, entertainment, local sights of interest, and whether beer is available for takeaway. List of the range of beers available at each establishment, including the identification of the flagship product. The author's choice of the "best beer" for each establishment, which is rarely its most popular or best known offering. 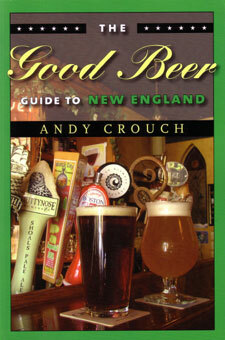 Essays on the brewing process, as well as on understanding and appreciating beer. An annotated list of "eleven great New England beer bars."